This post reports on research looking at the impact of blogs and magazine articles on consumers’ attitude towards a brand, and on their intentions to purchase. Sometimes you choose a topic to write about. Other times, though, it really feels like it is the topic that chooses you. That’s what happened this time. I was reading an assignment submitted by a student, when I came across a reference to a study looking at the impact of a blog post vs. a magazine article in consumer behaviour. I knew that I had to follow this reference up and share it with you. So, here it is. The article in question was published in the Journal of Advertising Research. It was authored by two academics at the Stockholm School of Economics, Jonas Colliander and Micael Dhalén, and is entitled “Following the Fashionable Friend: The Power of Social Media – Weighing the Publicity Effectiveness Of Blogs versus Online Magazines”. Colliander and Dahlén set out to compare the effectiveness of publicity via blogs vs. publicity via online magazines. The researchers placed identical texts about one brand in blogs and in online magazines. Then, they measured the impact of the texts on attitudes and intentions toward that brand. The study was conducted in the fashion industry. 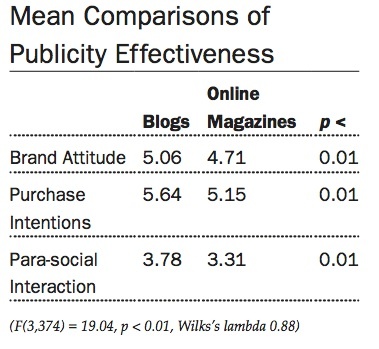 The authors concluded that both attitude towards the brand and intention to purchase were higher after reading the story on the blog, than after reading the same story on the magazine (see table). That is, blog publicity is more effective than online magazine’s. The effect of blogs on readers’ attitudes and intentions is similar to that of word of mouth. Readers are highly susceptible to the opinions of bloggers, whom they perceive to be an unbiased and credible source of information. Many brands understand this and have been reaching out to bloggers. The challenge is, then, to get the bloggers’ attention and to motivate them to review and write about the company’s products, while maintaining the (much-valued) bloggers’ independence. 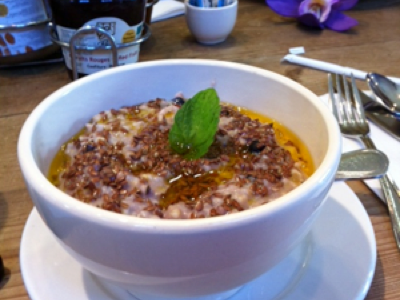 It was a blog post that inspired me to try ‘Le Pain Quotidien’, for instance. What about you? Did you change your view towards a brand – or did you make purchase decisions – based on a blog post that you read? Posted on March 14, 2012 October 27, 2014 by anacanhotoPosted in Marketing in everyday lifeTagged Attitude, Blog, Bloggers, Colliander and Dahlén 2011, Consumer behaviour, eWoM, Influence, WoM. Previous Previous post: What makes a great teacher? In Malaysia, we have companies that target advertising through bloggers. From what I heard, this kind of business is doing very well. The bloggers earn a lot from writing review for brands. Some even got famous. No one really read magazine anymore. We have to go out and buy it and the review is presumably to be bias. To get some brands review in magazine normally takes longer than reading a blog post. I guess the speed and convenience of information are the main selling point. This study compared blogs with online magazines (sorry, I should have made that clearer), because of the very problem you mentioned: convenience. Apparently, they (online magazines) are quite common in fashion (the focus of the study).But… with the number of professional bloggers on the increase, reviewing products for money, I wonder whether this view of bloggers as unbiased sources of information will change.Thanks for stopping by. Jennifer. Have a great week.